solar low res, originally uploaded by Chemical Industry Insider. 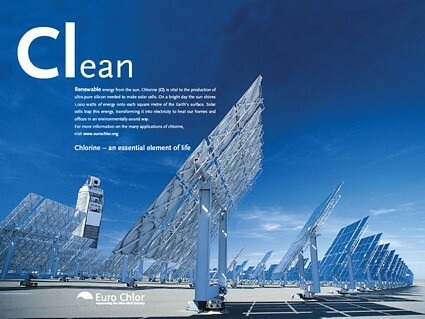 EuroChlor, the part of Cefic which represents the chlorine sector has decided it is going to tell the 40 000 people who live in Brussels, Belgium and work at European insititutions about the products that Chlorine makes possible through three stylish posters. They feature an astronaut with a polycarbonate vistor, polyurethane soled shoes and solar panels. None of these things contain chlorine, but you couldn't make them with out it. I've been going on about podcasting lately, for a sample of what's on offer at ICIS radio click on the link below. It's an exclusive interview about how Europe’s chemical industry faces challenges from the Middle East and Asia. Is the continent is losing its competitiveness? Edouard Croufer, formerly UCB’s director general, a former president of Exxon Chemical Belgium/Holland and now with Arthur D Little, talks to Simon Robinson. Full interview in ICIS Chemical Business 16 January 2006. My worries about the effect on the US economy of Hurrican Katrina is further strengthened today by this story in today's Financial Times. It suggests that the uninsured losses in New Orleans coudl be between $65 billion and $85 billion. If you want to hear a webcast debate on the prospects check this out... Martin Wolf and Michael Lind answer your questions on the political and economic impact of Hurricane Katrina on Monday, September 12 at 3pm BST. Both the FT links are subscription only, but an online FT sub is available for about £6/month. The visa application is in, the Embassy was expecting me (thanks BASF) and I collect my entry ticket on Friday next week. We are off on 25 September. In addition to writing for European Chemical News, my main day job, I'll be filling for ICIS news, the online service that my employer operates and I'll be trying to blog. This rather assumes that jet lag works in my favour and I've got bursts of insomnia to fill. I'll be reactivating my other self and duplicating filings to http://chemicalindustry.blogspot.com just in case there are access problems with Bizbuzzmedia. Belt and Braces really. Among the more interesting things happening in the line were: a woman reading phrenology, and a pair of professional visa collectors who decided that the Chinese Embassy was busier now than at "any time the past five years, John". Clearly China's economy is booming. Will Katrina Blow the Global Economy off course? One question that will be important in the coming weeks and months is: how will Hurricane Katrina affect the mindset of indebted American consumers? These consumers have been spending more than they saved for many years and this has helped to drive the global economy along. Couple a relatively high level of debt and the high proportion of uninsured homes destroyed by the Hurricane and you have a recipe for long-term misery as consumers try to craw out from under the additional mass of debt. Either they will be forced to cut discretionary spending and pay off debts, or they’ll go bankrupt and the problem will more immediately be the banks. The process will be alleviated to some extent by government projects to rebuild. But the incerased cost of gasoline,as Americans come closer to paying European prices, will also have a damping effect on the economy. But the Hurricane has considerably reduced the capital of a large part of the United States. Something tells me we will all pick up the tab.